Natural light streams through a trio of arched windows melding elegance, functionality and design in this master bedroom. When the homeowners decided to build their dream home, they tasked local architect Ben Patterson with the design. Patterson says it’s nice when clients come to him with different ideas and styles – he says this couple likes arches. Their previous home had arched windows and doors in it, and they wanted that same aesthetic throughout their new house. Provided by the Kitchen & Bath Cottage, the look of these 9-foot-tall Marvin windows is kicked up a notch with the addition of the flowing arches that encompass nearly the entire wall. Situated on a hill, the master suite sits up high, the windows inviting in the best views of the outdoors and a backyard oasis that includes a swimming pool. “In design, three of something looks better,” said Patterson. This window trio makes this large bedroom feel even bigger, thanks to the Rule of Three. Basically, following this guideline means placing items in groups of odd numbers. The human brain registers these groupings as more interesting and memorable, because the focal point is apparent. Three is the golden number, but 5, 7 and 9 work well also. Kori Shurley of Kori Shurley Design says the homeowners wanted a simple look in the room, so the walls are neutral with just a hint of greenish-gray. The flooring is a character grade white oak – it shows the knots and imperfections. “It was important that [the room] had a little bit of color to it, but was something very light and peaceful feeling,” she said. The window treatments are simple – a neutral light-colored linen that ties in the colors of the rest of the space. The room-darkening draperies block out the abundance of light so the homeowners can sleep well. Shurley also put the drapery on a motorized rod, since so much fabric was needed to cover the sizeable bank of windows. The curtains open and close with a remote control. Shurley says this limits the need to touch the curtains and helps protect the fabric as well. 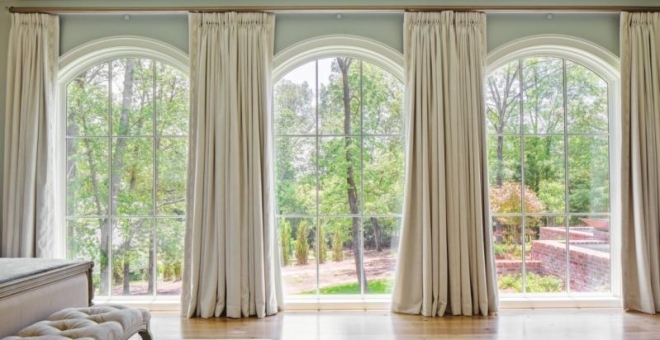 “The windows were so pretty and allowed in so much light we didn’t want anything super-heavy, but we also wanted the drapery to be functioning,” said Shurley.